After a fine summer of weather, cricketers from across the county congregated at Wimborne and Colehill Cricket Club for the annual presentation evening. League Chairman John Ridout hailed the season a triumph, especially after last year’s incessant rain. He said: “It was lovely to see so many completed fixtures compared with last season. We only had one or two wash-outs when no cricket was played. Representatives of the sponsors, The Dorset Funeral Plan, attended to present the awards. Once again it was Parley who marched away with the Premier League title, winning it by 35 points and losing just one match. Skipper Rosham Embalalagama received the award for the team that has won the league or come runners-up for the last five years. The team play at Dean Park, the former county ground in Bournemouth, and held off the nearest challengers, Ferndown Wayfarers. Wayfarers’ captain Eric Linge picked up the runners-up award, which was a great achievement after several seasons flirting with relegation. 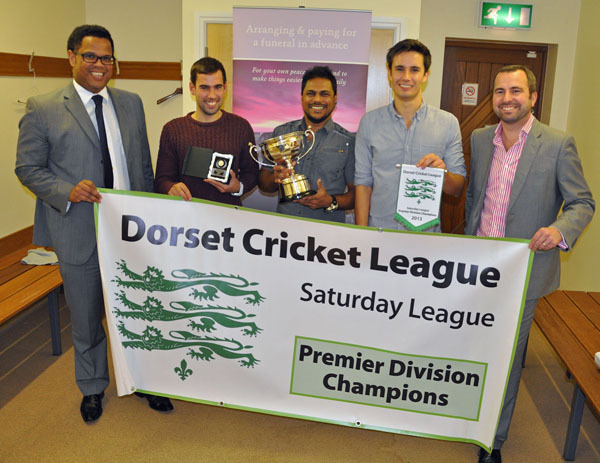 In Division One, Sherborne came out on top by quite some distance and Paul Hancock picked up the award and will be hoping that his team once again become a major force in the county’s cricket scene. Runners-up in Division One were Bere Regis who started slowly but had a great finish to the season. Due to a restructuring of the leagues no one is promoted out of Division One to the Premier League, but neither Sherborne or Bere Regis lacked in motivation. In Division Two there was a nail-biting conclusion to the season with just two points separating Christchurch, the winners, from runners-up Shillingstone. Both teams won 15 games and lost one. Cerne Valley and Cattistock fought things out at the top of Division Three, and they were separated by just eight points with Cerne Valley taking the title. Cattistock’s Martin Langford received the runners-up award, one of two he picked up on the night. In Division Four it was Wareham who topped the table with just one defeat, and Bridport came second after pipping Pimperne. Liam Toohill from Bridport was present to collect the award. Shillingstone IIs came top of Division Five (North and West), narrowly beating Crewkerne. 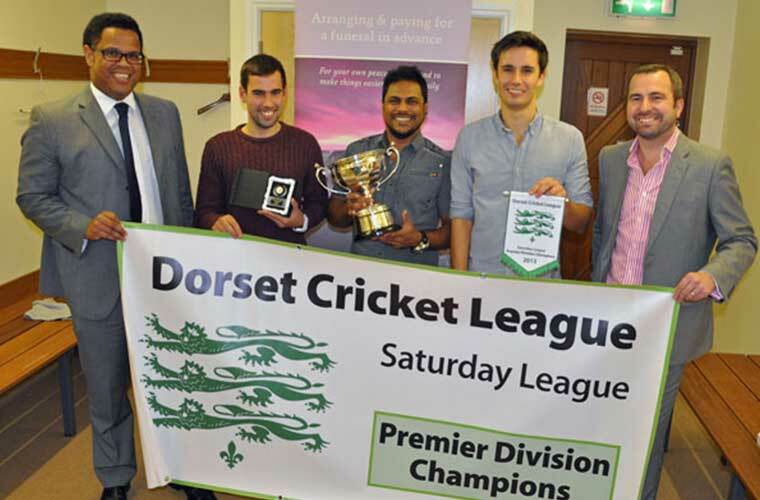 In Division Five (South and East) it was Sturminster Marshall who beat Swanage IIs to the title. The evening also saw several special awards presented. These included the Team Achievement award which was won by Christchurch and Ben Rayner and Nick Marsh collected it on behalf of the club. Ben Bridgen from Wimborne and Colehill received the Achievement Award for scoring – in one match – 133 then taking 7-26. How’s that? Groundsman of the year was won by Martinstown and the Fair Play award was won by Swanage. Ian Booth from Swanage was presented with the award by Merrick Wilkinson, a member of the umpiring committee. Individual Perfmornace: Ben Bridgen from Wimborne and Colehill CC.